Number of shares of Legacy Education Alliance, Inc. Common Stock, $0.0001 par value, outstanding as of November 10, 2017: 23,007,519. Some of the statements in this Quarterly Report on Form 10-Q under the headings “Condensed Consolidated Financial Statements” and “Management’s Discussion and Analysis of Financial Condition and Results of Operations” and elsewhere contain forward-looking statements within the meaning of the Private Securities Litigation Reform Act of 1995. We may also make written or oral forward-looking statements in our periodic reports on Forms 10-K, 10-Q and 8-K, in press releases and other written materials and in oral statements made by our officers, directors or employees to third parties. Statements that are not historical facts, including statements about our beliefs and expectations, are forward-looking statements. Forward looking statements are often identified by words such as “outlook,” “believes,” “estimates,” “expects,” “projects,” “may,” “intends,” “plans,” “anticipates,” “foresees,” “future” or similar expressions or by discussions of strategy, plans or intentions. However, the absence of these words or similar expressions does not mean that a statement is not forward-looking. All statements that address operating performance, events or developments that we expect or anticipate will occur in the future-including statements related to: our discussions regarding the introduction of additional brands into the U.S. market (e.g., The Independent Woman, Women in Wealth and Brick Buy Brick) which are expected to grow and diversify our U.S. revenue; the development of online courses which are expected to add revenue growth; projections of strong international growth; expected cost savings from symposium fulfillment experience that should lead to increased margins; shortening of course package contracts that should accelerate revenue recognition; our ability to address or manage corruption concerns in certain locations in which we operate; our ability to address and manage cyber-security risks; our ability to protect our intellectual property, on which our business is substantially dependent; our expectations regarding future divided payments; our expectations regarding the impact of general economic conditions on our business are forward-looking statements. Forward-looking statements involve known and unknown risks, uncertainties, assumptions and other important factors that could cause the actual results, performance or our achievements, or industry results, to differ materially from historical results, any future results, or performance or achievements expressed or implied by such forward-looking statements. There are a number of risks and uncertainties that could cause our actual results to differ materially from the forward-looking statements contained in this report. Important factors that could cause our actual results to differ materially from those expressed as forward-looking statements are set forth in this report, in our latest Annual Report on Form 10-K, including but not limited to “Part I, Item 1A. Risk Factors” and “Part II, Item 7. Management’s Discussion and Analysis of Financial Condition and Results of Operations” therein, and in our other filings with the Securities and Exchange Commission (the “SEC”). There may be other factors of which we are currently unaware or deem immaterial that may cause our actual results to differ materially from the forward-looking statements. Although we believe the assumptions underlying our forward-looking statements are reasonable, any of these assumptions, and, therefore, also the forward-looking statements based on these assumptions could themselves prove to be inaccurate. In addition, to the extent any inconsistency or conflict exists between the information included in this report and the information included in our prior reports and other filings with the SEC, the information contained in this report updates and supersedes such information. Forward-looking statements are based on current plans, estimates, assumptions and projections, and therefore you should not place undue reliance on them. Forward-looking statements speak only as of the date they are made, and we undertake no obligation to update them publicly in light of new information or future events. The terms “Legacy Education Alliance, Inc.,” the “Company,” “we,” “our,” “us” or "Legacy" as used in this report refer collectively to Legacy Education Alliance, Inc., a Nevada corporation (“Legacy”), the registrant, which was formerly known as Priced In Corp., and, unless the context otherwise requires, together with its wholly-owned subsidiary, Legacy Education Alliance Holdings, Inc., a Colorado corporation, other operating subsidiaries and any predecessor of Legacy Education Alliance Holdings, including Tigrent Inc., a Colorado corporation (“TIGE”). This Form 10-Q includes financial statements and related notes that present the condensed consolidated financial position, results of operations, comprehensive income (loss), and cash flows of Legacy and its subsidiaries. Business Description. We are a provider of practical, high-quality, and value-based educational training on the topics of personal finance, entrepreneurship, real estate and financial markets investing strategies and techniques. Our programs are offered through a variety of formats and channels, including free-preview workshops, basic training classes, symposiums, telephone mentoring, one-on-one mentoring, coaching and e-learning, primarily under the Rich Dad® Education brand (“Rich Dad”) which was created in 2006 under license from entities affiliated with Robert Kiyosaki, whose teachings and philosophies are detailed in the book titled, Rich Dad Poor Dad. In addition to Rich Dad, we market our products and services under a variety of brands, including Martin Roberts, The Independent Woman, Women in Wealth and Brick Buy Brick. Our products and services are offered in the United States (“U.S.”), Canada, the United Kingdom (“U.K.”) and Other Foreign Markets. Basis of Presentation. The terms “Legacy Education Alliance, Inc.,” the “Company,” “we,” “our,” “us” or "Legacy" as used in this report refer collectively to Legacy Education Alliance, Inc., a Nevada corporation (“Legacy”), the registrant, which was formerly known as Priced In Corp., and, unless the context otherwise requires, together with its wholly-owned subsidiary, Legacy Education Alliance Holdings, Inc., a Colorado corporation, other operating subsidiaries and any predecessor of Legacy Education Alliance Holdings, including TIGE. The accompanying unaudited condensed consolidated financial statements presented herein are for us and our consolidated subsidiaries, each of which is a wholly-owned subsidiary. The accompanying condensed consolidated balance sheet as of December 31, 2016 was derived from our audited consolidated financial statements and does not include all disclosures required under United States of America generally accepted accounting principles (“U.S. GAAP”), for annual financial statements. All significant intercompany transactions have been eliminated. These interim financial statements should be read in conjunction with the consolidated financial statements included in our Annual Report on Form 10-K for the year ended December 31, 2016 and reflect all normal recurring adjustments that are, in the opinion of management, necessary to present fairly our results of operations and financial position. Amounts reported in our Condensed Consolidated Statements of Operations and Comprehensive Income (Loss) are not necessarily indicative of amounts expected for the respective annual periods or any other interim period. Significant Accounting Policies. Our significant accounting policies have been disclosed in Note 2 - Significant Accounting Policies in our most recent Annual Report on Form 10-K. There have been no changes to the policies disclosed therein. The accompanying unaudited condensed consolidated financial statements we present in this report have been prepared in accordance with those policies. Use of Estimates. The preparation of condensed consolidated financial statements in conformity with accounting principles generally accepted in the United States of America requires management to make estimates and assumptions that affect the reported amounts of assets and liabilities and disclosure of contingent assets and liabilities at the date of the condensed consolidated financial statements and the reported amounts of revenues and expenses during the reporting period. Actual results could differ from those estimates. Income Tax in Interim Periods. We conduct operations in separate legal entities in different jurisdictions. As a result, income tax amounts are reflected in these condensed consolidated financial statements for each of those jurisdictions. Tax laws and tax rates vary substantially in these jurisdictions and are subject to change based on the political and economic climate in those countries. We file our tax returns in accordance with our interpretations of each jurisdiction’s tax laws. We record our tax provision or benefit on an interim basis using the estimated annual effective tax rate. This rate is applied to the current period ordinary income or loss to determine the income tax provision or benefit allocated to the interim period. Losses from jurisdictions for which no benefit can be realized and the income tax effects of unusual and infrequent items are excluded from the estimated annual effective tax rate. Valuation allowances are provided against the future tax benefits that arise from the losses in jurisdictions for which no benefit can be realized. The effects of unusual and infrequent items are recognized in the impacted interim period as discrete items. The estimated annual effective tax rate may be affected by nondeductible expenses and by our projected earnings mix by tax jurisdiction. Adjustments to the estimated annual effective income tax rate are recognized in the period during which such estimates are revised. We have established valuation allowances against our deferred tax assets, including net operating loss carryforwards and income tax credits. Valuation allowances take into consideration our expected ability to realize these deferred tax assets and reduce the value of such assets to the amount that is deemed more likely than not to be realizable. Our ability to realize these deferred tax assets is dependent on achieving our forecast of future taxable operating income over an extended period of time. We review our forecast in relation to actual results and expected trends on a quarterly basis. A change in our valuation allowance would impact our income tax expense/benefit and our stockholders’ deficit and could have a significant impact on our results of operations or financial condition in future periods. We have implemented all new accounting pronouncements that are in effect and that management believes would materially affect our financial statements. In July 2017, the Financial Accounting Standards Board (the “FASB”) issued Accounting Standards Update (“ASU”) 2017-11, I “Accounting for Certain Financial Instruments With Down Round Features” and II “Replacement of the Indefinite Deferral for Mandatorily Redeemable Financial Instruments of Certain Nonpublic Entities and Certain Mandatorily Redeemable Noncontrolling Interests With a Scope Exception”. This standard is effective for fiscal years and interim periods beginning after December 15, 2018. Early adoption is permitted. We are currently evaluating the effect that the adoption of this standard will have on our financial statements and expect to adopt this standard when effective. In November 2016, the FASB issued ASU 2016-18, “Statement of Cash Flows: Restricted Cash,” which provides guidance about the presentation of changes in restricted cash and restricted cash equivalents on the statement of cash flows. This standard is effective for fiscal years and interim periods beginning after December 15, 2017 and will be applied using a retrospective transition method to each period presented. Early adoption was permitted. We are currently evaluating the effect that the adoption of this standard will have on our financial statements and expect to adopt this standard when effective. In October 2016, the FASB issued ASU 2016-16, “Income Taxes: Intra-Entity Transfers of Assets Other Than Inventory,” which removes the prohibition against the immediate recognition of the current and deferred income tax effects of intra-entity transfers of assets other than inventory. This standard is effective for fiscal years and interim periods beginning after December 15, 2017 and will be applied using a modified retrospective basis. Early adoption was permitted. We are currently evaluating the effect that the adoption of this standard will have on our financial statements and expect to adopt this standard when effective. In August 2016, the FASB issued ASU 2016-15, “Statement of Cash Flows: Classification of Certain Cash Receipts and Cash Payments.” This ASU provides guidance and clarification in regards to the classification of eight types of receipts and payments in the statement of cash flows, including debt repayment or extinguishment costs, settlement of zero-coupon bonds, proceeds from the settlement of insurance claims, distributions received from equity method investees and cash receipts from beneficial interest in securitization transactions. This standard is effective for fiscal years and interim periods beginning after December 15, 2017 and will be applied using a retrospective transition method to each period presented. Early adoption is permitted. We expect to adopt this standard when effective, and do not expect this guidance to have a significant impact on our financial statements. In March 2016, FASB issued ASU No 2016-09 “Compensation – Stock compensation.” The new guidance is intended to simplify some provisions in stock compensation accounting, including the accounting for income taxes, forfeitures, and statutory tax withholding requirements, as well as classification in the statement of cash flows. This standard is effective for fiscal years and interim periods beginning after December 15, 2016. Early adoption was permitted. We adopted this standard in the first quarter of 2017. The adoption of this guidance did not have a significant impact on our financial statements. As permitted by the standard, we will account for forfeitures of share-based payments when they occur. In January 2016, the FASB issued ASU No 2016-01, “Recognition and Measurement of Financial Assets and Financial Liabilities,” Financial Instruments – Overall (Subtopic 825-10). The new guidance is intended to improve the recognition and measurement of financial instruments. This guidance requires that financial assets and financial liabilities must be separately presented by measurement category and form of financial asset on the balance sheet or the accompanying notes to the financial statements. This guidance is effective for fiscal years and interim periods beginning after December 15, 2017. The standard includes a requirement that businesses must report changes in the fair value of their own liabilities in other comprehensive income instead of earnings, and this is the only provision of the update for which the FASB is permitting early adoption. We expect to adopt this guidance when effective, and do not expect this guidance to have a significant impact on our financial statements. In May 2014, the FASB issued ASU No. 2014-09, “Revenue from Contracts with Customers (Topic 606).” The standard is a comprehensive new revenue recognition model that requires revenue to be recognized in a manner to depict the transfer of goods or services to a customer at an amount that reflects the consideration expected to be received in exchange for those goods or services. In August 2015, the FASB delayed the effective date of its revenue recognition standard to be effective for fiscal years and interim periods beginning after December 15, 2017. The standard allows companies to choose either full retrospective or modified retrospective adoption method. We expect to adopt this guidance when effective using modified retrospective adoption method. We have reviewed the accounting for training and service sales, and for product sales, while we are still in the process of finalizing our review results, we do not expect the adoption of this guidance to have a significant impact on our financial statements. We account for share-based awards under the provisions of ASC 718, “Compensation—Stock Compensation.” Accordingly, share-based compensation cost is measured at the grant date based on the fair value of the award and we expense these costs using the straight-line method over the requisite service period. Share-based compensation expenses related to our restricted stock grants were $61.0 thousand and $43.0 thousand for the three months ended September 30, 2017 and 2016, respectively, and $168.0 thousand and $117.0 thousand for the nine months ended September 30, 2017 and 2016, respectively, which are reported as a separate line item in the condensed consolidated statement of changes in stockholders’ deficit. During the nine months ended September 30, 2017, pursuant to the 2015 Incentive Plan, we awarded 280,002 shares of restricted stock to our employees, which are subject to a three-year cliff vesting and 120,000 shares of restricted stock to members of the Board of Directors, which are subject to a two-year cliff vesting. The grant date price per share was $0.33 for a total grant date fair value of $0.1 million. See Note 6 - Share-Based Compensation, in the Notes to Consolidated Financial Statements for the year ended December 31, 2016, included in our 2016 Annual Report for further discussion. Basic EPS is computed by dividing net income by the basic weighted-average number of shares outstanding during the period. Diluted EPS is computed by dividing net income by the diluted weighted-average number of shares outstanding during the period and, accordingly, reflects the potential dilution that could occur if securities or other agreements to issue common stock, such as stock options, were exercised, settled or converted into common stock and were dilutive. The diluted weighted-average number of shares used in our diluted EPS calculation is determined using the treasury stock method. Unvested awards of share-based payments with rights to receive dividends or dividend equivalents, such as our restricted stock awards, are considered to be participating securities, and therefore, the two-class method is used for purposes of calculating EPS. Under the two-class method, a portion of net income is allocated to these participating securities and is excluded from the calculation of EPS allocated to common stock. Our restricted stock awards are subject to forfeiture and restrictions on transfer until vested and have identical voting, income and distribution rights to the unrestricted common shares outstanding. Our weighted average unvested restricted stock awards outstanding were 1,746,748 and 1,020,068 for the three months ended September 30, 2017 and 2016, and 1,525,502 and 930,674 for the nine months ended September 30, 2017 and 2016. ASC 820, “Fair Value Measurements and Disclosures” defines fair value, establishes a consistent framework for measuring fair value and expands disclosure requirements about fair value measurements. ASC 820 requires entities to, among other things, maximize the use of observable inputs and minimize the use of unobservable inputs when measuring fair value. ASC 820 defines fair value as the exchange price that would be received for an asset or paid to transfer a liability (an exit price) in the principal or most advantageous market for the asset or liability in an orderly transaction between market participants on the measurement date. ASC 820 specifies a hierarchy of valuation techniques based on whether the inputs to those valuation techniques are observable or unobservable. Observable inputs reflect market data obtained from independent sources, while unobservable inputs reflect our market assumptions. ● Level 3-Inputs that are unobservable and reflect our assumptions used in pricing the asset or liability based on the best information available under the circumstances (e.g., internally derived assumptions surrounding the timing and amount of expected cash flows). Financial Instruments. Financial instruments consist primarily of cash and cash equivalents, accounts payable, deferred course expenses, accrued expenses, deferred revenue, and debt. U.S. GAAP requires the disclosure of the fair value of financial instruments, including assets and liabilities recognized in the balance sheets. Management believes the carrying value of the other financial instruments recognized on the condensed consolidated balance sheet date, including receivables, payables and accrued liabilities approximate their fair value. See Note – 6 Derivative Liability, for further discussion. In June 2015, we granted warrants to purchase 959,924 shares of the Company’s common stock through a private offering of units (“Units”). Each Unit included one share of Common Stock, par value $0.0001 per share, and a three-year Warrant to purchase one share of Common Stock at an initial exercise price per share equal to $0.75, subject to adjustment for certain corporate transactions such as a merger, stock-split or stock dividend and, if the Company does not continue to be a reporting company under the Securities Exchange Act of 1934 during the two-year period after closing, the exercise price will be reduced to $0.01 per share. Each Unit includes limited registration rights for the investors for the shares of Common Stock and the shares of Common Stock that would be issued upon the exercise of a Warrant ("Underlying Shares") when and if we register our shares of Common Stock in a different offering, subject to certain excluded registered offerings. The Company has also issued to the placement agent warrants to purchase our shares of Common Stock equal to 10% of the total shares sold in the offering, or 95,992 shares. Because these warrants have full reset adjustments that would preclude the instrument from being considered as index to the Company’s stock, it is subject to derivative liability treatment under ASC 815-40-15, which requires as of the date the warrants are issued, the derivative liability to be measured at fair value and re-evaluated at the end of each reporting period. As of September 30, 2017 and December 31, 2016, the fair value of the total warrants' derivative liability is $11,811 and $108,809, respectively, and recorded in other accrued expenses in the Condensed Consolidated Balance Sheets. We recognized a gain on the derivative liability of $9,573 and $2,133 for the three months ended September 30, 2017 and 2016, respectively, and $96,998 and $4,956 for the nine months ended September 30, 2017 and 2016, respectively. We record gain and loss on the derivative liability in other income, net in the Condensed Consolidated Statements of Operations and Comprehensive Income (Loss). The Company recorded an income tax expense of $119.0 thousand and $8.0 thousand for the three months ended September 30, 2017 and 2016, respectively. The Company recorded an income tax benefit of $107.0 thousand and income tax expense of $27.0 thousand for the nine months ended September 30, 2017 and 2016, respectively. Our effective tax rate was 7.9% and 0.7% for the three months ended September 30, 2017 and 2016, respectively, and (3.7)% and 1.0% for the nine months ended September 30, 2017 and 2016, respectively. Our effective tax rates differed from the U.S. statutory corporate tax rate of 35.0% primarily because of the mix of pre-tax income or loss earned in certain jurisdictions and the change in our valuation allowance. During the three months ended December 31, 2016, we determined that valuation allowances against U.S. and U.K. (Rich Dad Education Limited only) deferred taxes were no longer required. Release of these valuation allowances resulted in a $2.4 million tax benefit, partially offset by tax on current period book income and other permanent and timing differences resulting in an income tax benefit. Release of the valuation allowances decreased our effective tax rate by 83.1%. We record a valuation allowance when it is more likely than not that some portion, or all, of the deferred tax assets will not be realized. As of September 30, 2017 and December 31, 2016, valuation allowances of $4.1 million and $4.5 million, have been provided against net operating loss carryforwards and other deferred tax assets. We decreased our valuation allowance by $0.4 million and $1.1 million for the nine months ended September 30, 2017 and 2016, respectively. As of September 30, 2017 and December 31, 2016, we had total unrecognized tax benefits of $1.7 million, respectively, related to foreign and domestic tax positions. Of this amount, the Company estimates that $0.5 million, of the unrecognized tax benefits, if recognized, would impact the effective tax rate. A substantial portion of our liability for uncertain tax benefits is recorded as a reduction of net operating losses and tax credit carryforwards. During the nine months ended September 30, 2017 and 2016, we had no material changes in uncertain tax positions. We record interest and penalties related to unrecognized tax benefits within the provision for income taxes. We believe that no current tax positions that have resulted in unrecognized tax benefits will significantly increase or decrease within one year. We file income tax returns in the U.S. federal jurisdiction and in various state and foreign jurisdictions. The Company was notified by the Internal Revenue Service that its federal income tax returns for the years 2013-2015 were selected for examination. The Company believes its provision for income taxes is adequate; however any assessment would affect the Company’s results of operations and possibly its cash flows. We were also notified by the Canadian Revenue Agency that our 2014-2016 goods and services tax (GST) and harmonized sales tax (HST) returns are being audited. Cash and cash equivalents. We maintain deposits in banks in amounts that might exceed the federal deposit insurance available. Management believes the potential risk of loss on these cash and cash equivalents to be minimal. 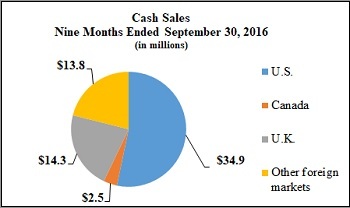 Cash balances as of September 30, 2017 and December 31, 2016, including foreign subsidiaries, without FDIC coverage were $3.8 million and $1.0 million. Revenue. A significant portion of our revenue is derived from the Rich Dad brands. Revenue derived from the Rich Dad brands as a percentage of total revenue was 71.8% and 74.4% for the three months ended September 30, 2017 and 2016, respectively, and 71.7% and 74.6% for the nine months ended September 30, 2017 and 2016, respectively. In addition, we have operations in the U.S., Canada, the U.K. and other foreign markets (see Note 9 — Segment Information). We manage our business in four operating segments based on geographic location for which operating managers are responsible to the Chief Operations Officer. As such, operating results, as reported below, are reviewed regularly by our Chief Operating Officer, or Chief Operating Decision Maker (“CODM”) and other members of the executive team. Licensing agreements. We are committed to pay royalties for the usage of certain brands, as governed by various licensing agreements, including Rich Dad, Robbie Fowler and Martin Roberts. Total royalty expenses included in our Condensed Consolidated Statements of Operations and Comprehensive Income (Loss) were $1.1 million and $1.2 million for the three months ended September 30, 2017 and 2016, respectively, and $3.7 million and $3.3 million for the nine months ended September 30, 2017 and 2016, respectively. Custodial and Counterparty Risk. We are subject to custodial and other potential forms of counterparty risk in respect to a variety of contractual and operational matters. In the course of ongoing Company-wide risk assessment, management monitors our arrangements that involve potential counterparty risk, including the custodial risk associated with amounts prepaid to certain vendors and deposits with credit card and other payment processors. Deposits held by our credit card processors at September 30, 2017 and December 31, 2016, were $3.3 million and $3.1 million, respectively. These balances are included on the Condensed Consolidated Balance Sheets in restricted cash. While these balances reside in major financial institutions, they are only partially covered by federal deposit insurance and are subject to the financial risk of the parties holding these funds. When appropriate, we utilize Certificate of Deposit Account Registry Service (CDARS) to reduce banking risk for a portion of our cash in the United States. A CDAR consists of numerous individual investments, all below the FDIC limits, thus fully insuring that portion of our cash. At September 30, 2017 and December 31, 2016, we did not have a CDAR balance. Purchase commitments. From time to time, the Company enters into non-cancelable commitments to purchase professional services, information technology licenses and support, and training courses in future periods. The amount of these non-cancelable commitments made by the Company at December 31, 2016 was approximately $0.7 million. There was no non-cancellable purchase commitment made by the Company at September 30, 2017. Litigation. We and certain of our subsidiaries, from time to time, are parties to various legal proceedings, claims and disputes that have arisen in the ordinary course of business. These claims may involve significant amounts, some of which would not be covered by insurance. A substantial settlement payment or judgment in excess of our accruals could have a material adverse effect on our financial position, results of operations or cash flows. While the outcome of these proceedings cannot be predicted with certainty, we do not expect any of these existing matters, individually or in the aggregate, to have a material adverse effect upon our financial position, results of operations or cash flows. There have been no material changes to the legal proceedings disclosed in the litigation section of Note 15 - Commitments and Contingencies, in the Notes to Consolidated Financial Statements for the year ended December 31, 2016, included in our 2016 Annual Report. Watson v. Whitney Education Group, Inc. Russ Whitney, United Mortgage Corporation, Gulfstream Realty and Development, Inc. Douglas Realty, Inc. and Paradise Title Services, Inc., first filed September 21, 2007 in the 20th Judicial Circuit, Lee County, FL, Case No. 07-CA-011207; Huron River Area Credit Union v. Jeffrey Watson/ Watson v. Whitney Education Group, Inc. and Russell Whitney, Case No. 2008-CA-5870-NC; and Huron River Area Credit Union v. Jeffrey Watson/ Watson v. Whitney Education Group, Inc. and Russell Whitney, Case No. 2008-CA-5877-NC, both filed June 6, 2008 in the 12th Judicial Circuit, Sarasota County, FL Civil Division. In these related cases, Jeffrey Watson (“Watson”) alleged against a subsidiary of the Company causes of action based upon losses Watson alleges he incurred as the result of his purchase of real property from Gulfstream Realty and Development, an entity affiliated with Mr. Whitney, and with whom we had a student referral agreement. On February 6, 2017, we entered into a Settlement Agreement and General Release whereby all claims against the Company and Mr. Whitney were fully and finally settled and released, and all three cases dismissed with prejudice without any admission of wrongdoing in exchange for the payment of $30,000 by the Company to the Plaintiff. On November 1, 2017, Legacy announced it will receive an aggregate sum of Five Million Dollars ($5,000,000.00) to settle litigation brought to recover funds withheld from it in connection with the processing of credit card sales from 2007 through 2011. Under the terms of the settlement agreement entered into on October 31, 2017, Legacy has since received $5 million from Cynergy Holdings, LLC, Bank of America, N.A., BA Merchant Services, LLC, BMO Harris Bank, N.A., and Moneris Solutions, Inc. (“Defendants”). As part of the settlement, Legacy has agreed to dismiss the litigation currently pending in the Supreme Court of the State of New York, County of Queens without admission of wrongdoing on the part of any party. After accounting for outstanding legal fees, the net amount Legacy received from the settlement was $4,332,798. For more information on the terms of the settlement, please refer to the Current Report on Form 8-K filed by the Company with the Securities and Exchange Commission on November 1, 2017. A copy of the Form 8-K is available on the Company’s website at (http://ir.legacyeducationalliance.com/all-sec-filings). We have evaluated significant events and transactions that occurred after the balance sheet date and determined that there were no other events or transactions that would require recognition or disclosure in our condensed consolidated financial statements for the period ended September 30, 2017. We are a provider of practical, high-quality, and value-based educational training on the topics of personal finance, entrepreneurship, real estate and financial markets investing strategies and techniques. Our programs are offered through a variety of formats and channels, including free-preview workshops, basic training classes, symposiums, telephone mentoring, one-on-one mentoring, coaching and e-learning, primarily under the Rich Dad® Education brand (“Rich Dad”) which was created in 2006 under license from entities affiliated with Robert Kiyosaki, whose teachings and philosophies are detailed in the book titled, Rich Dad Poor Dad. In addition to Rich Dad, we market our products and services under a variety of brands, including Martin Roberts, Robbie Fowler. The Independent Woman, Women in Wealth and Brick Buy Brick. Our products and services are offered in the United States, Canada, the U.K. and Other Foreign Markets. Our students pay for their courses in full up-front or through payment agreements with independent third parties. Under United States of America generally accepted accounting principles (“U.S. GAAP”), we recognize revenue when our students take their courses or the term for taking their course expires, which could be several quarters after the student purchases a program and pays the fee. Over time, we have taken steps to shorten many of our course contracts from two-year contracts to one-year contracts, which is expected to accelerate revenue recognition as services are delivered faster and/or contract terms expire sooner. We also continue to expand our innovative symposium-style course delivery model into other markets. Our symposiums combine multiple advanced training courses in one location, allowing us to achieve certain economies of scale that reduce costs and improve margins while also accelerating U.S. GAAP revenue recognition, while at the same time, enhancing our student's experience, particularly, for example, through the opportunity to network with other students. We also provide a richer experience for our students through one-on-one mentoring (two to four days in length, on site or remotely) and telephone mentoring (10 to 16 weekly one-on-one or one-on-many telephone sessions). Mentoring involves a subject matter expert interacting with the student remotely or in person and guiding the student, for example, through his or her first real estate transaction, providing a real hands-on experience. We were founded in 1996, and through a reverse merger, became a publicly-held company in November 2014. Today we are a global company with approximately 200 employees that has cumulatively served more than two million students from more than 150 countries and territories over the course of our operating history. We manage our business in four segments based on geographic location. 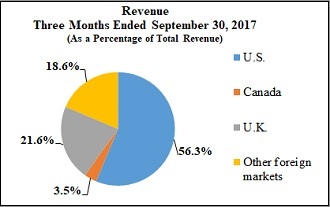 These segments include our historical core markets of the United States, Canada, and the U.K., with the fourth segment including all Other Foreign Markets. We continue to expand internationally. Starting in 2014, we expanded our footprint to include Africa, Europe, and Asia, holding events in 21 countries. As we established traction in these markets, we opened offices in South Africa and Hong Kong during the first six months of 2015. Overall, we added an additional five new countries to our footprint in 2015 for a total global reach of 26 countries. In 2016 we held more events in several of these countries than in the prior years. We intend to continue to focus on diversifying our sales internationally. ● Rich Dad® Education: Our flagship brand based on the teachings of Robert Kiyosaki, an entrepreneur, investor, educator, and author of Rich Dad Poor Dad. Mr. Kiyosaki has written more than 15 books with combined sales of more than 26 million copies. ● Rich Dad® Stock Education: In our Rich Dad Stock Education program, we teach students how to become savvy investors that can potentially create winning trades and profits in any market condition through the development of personal trading plans that are compatible with their current financial situation, the level of risk they are comfortable with, and their long-term financial goals. ● Making Money from Property with Martin Roberts™: A property-based curriculum focused on how and why to buy property at auction in the U.K. Based on the teachings of Martin Roberts, renowned U.K. TV personality, property expert, journalist, and author of Making Money from Property, our Making Money from Property program is designed to show investors tested strategies to buy at auction, as well as the difference between income and capital growth strategies, negotiating transactions, and buying properties overseas. ● Brick Buy Brick™: Initially launched in the U.K., Brick Buy Brick is now also available in the U.S., Canada and the other foreign markets in which we operate. The program introduces our students to the tools and strategies used by successful investors to make money work for them through real estate investing. ● Building Wealth: A program that offers students training on how to build and preserve wealth, start or manage a business, and benefit through investing in property regardless of market conditions. ● Robbie Fowler Property Academy™: Designed to teach investment strategies individuals can use to achieve a potential clear path towards long-term wealth, the goal of our Property Academy training program is to provide a comprehensive property investment education. We teach our students the investment strategies currently implemented throughout the U.K., such as Social Housing, Buy-To-Let, Lease Options, and Land Development. ● Women In Wealth™: Created to inspire women of all ages and backgrounds to potentially achieve financial security, Women In Wealth seeks to empower women with a strong financial education and help them learn the potential benefits of real estate investing to create cash flow and build financial independence. ● The Independent Woman™: Developed by women for women, is based on the teachings and principles of Kim Kiyosaki, investor, entrepreneur, and bestselling author of Rich Woman and It's Rising Time, The Independent Women program imparts the principles and strategies essential for potential financial independence. ● Trade Up Investor Education™: Built on the belief that a successful investor is an educated investor and developed in partnership with Investor's Business Daily®, a leading financial news and research organization since 1984, students are offered educational training designed to help them increase their knowledge of stock and options trading. We voluntarily filed a Form 10 Registration Statement with the Securities and Exchange Commission ("SEC") on May 12, 2017, and Amendment No 1 to Form 10 on June 27, 2017, to register our common stock, par value $0.0001 per share under the Securities Exchange Act of 1934. On July 11, 2017, we announced that the filed Form 10 Registration Statement was effective on that day. A copy of the Form 10 Registration Statement is available on the Company’s website at (http://ir.legacyeducationalliance.com/all-sec-filings). 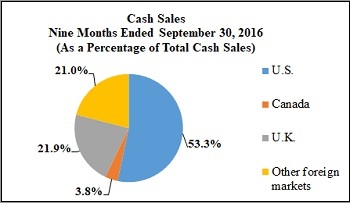 Cash sales were $75.7 million for the nine months ended September 30, 2017 compared to $65.5 million for the nine months ended September 30, 2016, an increase of $10.2 million or 15.6%. The increase was driven primarily by a $5.2 million increase in our Other Foreign Markets segment, a $3.2 million increase in our U.S. segment, and a $2.4 million increase in our U.K. segment, which was partially offset by a $0.6 million decrease in our Canada segment. We believe that cash sales remain an important metric when evaluating our operating performance. Pursuant to U.S. GAAP, we recognize revenue when our students take their courses or the term for taking their course expires, which could be several quarters after the student purchases a program. Our students pay for their courses in full up-front or through payment agreements with independent third parties. We anticipate cash sales to increase throughout 2017, particularly as new brands gain greater traction in our more established markets, and as we continue to expand internationally and hone our selling and marketing strategy in new markets. Over the past several years, our U.S. business shifted its focus from relying primarily on Rich Dad™ Education brand offerings and as our new proprietary brands gain greater traction in our more established markets, and as we continue to expand internationally the mix of revenue will become more diversified. We have developed and introduced into the market non-Rich Dad brands, such as The Independent Women, Woman in Wealth, Brick Buy Brick, and others to diversify our business, although our business to date in these brands has not been material to our Company as a whole. Revenue derived from the Rich Dad brands was $12.5 million and $12.1 million or as a percentage of total segment revenue was 87.6% and 87.5% for the three months ended September 30, 2017 and 2016, and $36.1 million and $37.8 million or as a percentage of total segment revenue was 88.6% and 88.1% for the nine months ended September 30, 2017 and 2016. The majority of the revenue derived from the Rich Dad™ Education brand offerings pertained to real estate-related education, with the balance pertaining to financial markets and entrepreneurial education. 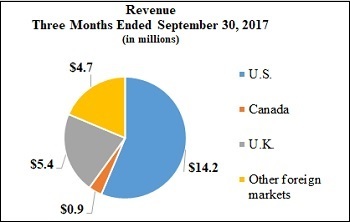 The U.S. segment revenue was $14.2 million and $13.8 million or as a percentage of total revenue was 56.3 % and 61.6% for the three months ended September 30, 2017 and 2016, and $40.8 million and $43.0 million or as a percentage of total revenue was 55.6% and 62.6% for the nine months ended September 30, 2017 and 2016. The increase in revenue of $0.4 million or 2.9% during the three months ended September 30, 2017 compared to the same period in 2016 was due to an increase in recognition of revenue from expired contracts of $1.4 million or 56.8%, partially offset by decreased attendance (i.e. fulfillment) of $1.0 million or 8.8%. The decrease in revenue of $2.2 million or 5.1% during the nine months ended September 30, 2017 compared to the same period in 2016, was primarily due to decreased attendance (i.e. fulfillment) of $1.6 million or 4.5%, a decrease in recognition of revenue from expired contracts of $0.3 million or 3.8%, and as a result of the decline in recognition of revenue of $0.3 million, due to the change in our revenue recognition policy with regards to DVD fulfillment. Similar to the U.S. segment, our Canadian segment's revenue primarily consists of Rich Dad™ Education branded offerings. Revenue derived from the Rich Dad brands was $0.8 million and $0.8 million or as a percentage of total segment revenue was 86.7% and 87.9% for the three months ended September 30, 2017 and 2016, and $1.9 million and $2.5 million or as a percentage of total segment revenue was 85.5% and 87.7% for the nine months ended September 30, 2017 and 2016. The majority of the revenue derived from the Rich Dad™ Education brand offerings pertained to real estate-related education, with the balance pertaining to financial markets and entrepreneurial education. 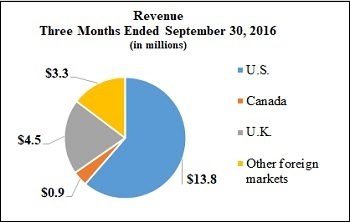 The Canadian segment revenue was $0.9 million and $0.9 million or as a percentage of total revenue was 3.5% and 3.9% for the three months ended September 30, 2017 and 2016, and $2.2 million and $2.9 million or as a percentage of total revenue was 3.0% and 4.2% for the nine months ended September 30, 2017 and 2016. 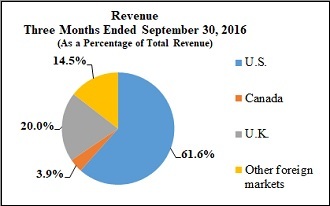 In contrast to our U.S. and Canadian segments, our U.K. segment's revenue is more diversified amongst our brand offerings. Revenue derived from the Rich Dad™ Education branded offerings was $1.0 million and $1.3 million or as a percentage of total segment revenue was 19.0% and 29.0% for the three months ended September 30, 2017 and 2016, and $3.8 million and $4.6 million or as a percentage of total segment revenue was 22.7% and 32.6% for the nine months ended September 30, 2017 and 2016. The majority of the revenue derived from the Rich Dad™ Education brand offerings pertained to real estate-related education, with the balance pertaining to financial markets and entrepreneurial education. 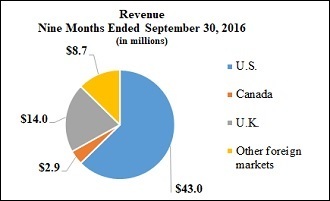 The U.K. segment revenue was $5.4 million and $4.5 million or as a percentage of total revenue was 21.6% and 20.0% for the three months ended September 30, 2017 and 2016, and $16.6 million and $14.0 million or as a percentage of total revenue was 22.6% and 20.4% for the nine months ended September 30, 2017 and 2016. 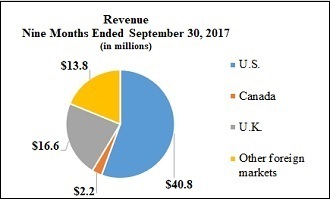 The increase in revenue of $0.9 million or 21.4% during the three months ended September 30, 2017 compared to the same period in 2016 was primarily due to increase in revenue as a result of increased attendance (i.e. fulfillment) of $0.8 million or 23.2%, and increase in recognition of revenue from expired contracts $0.1 million or 14.6%. The increase in revenue of $2.6 million or 18.6% during the nine months ended September 30, 2017 compared to the same period in 2016 was primarily due to increase in revenue as a result of increased attendance (i.e. fulfillment) of $2.2 million or 20.2%, and increase in recognition of revenue from expired contracts $0.4 million or 12.8%. We operate in other foreign markets, including Australia and New Zealand and European, Asian and African countries. Our Other Foreign Markets segment is gaining traction and has shown significant growth in revenue. The go to market strategy initially focused primarily on our proprietary brands and as we established a market presence that diversified our offerings to include the Rich Dad™ Education brand offerings. Revenue derived from the Rich Dad brands was $3.8 million and $2.5 million or as a percentage of total segment revenue was 81.6% and 77.7% for the three months ended September 30, 2017 and 2016, and $10.8 million and $6.3 million or as a percentage of total segment revenue was 78.7% and 71.7% for the nine months ended September 30, 2017 and 2016. 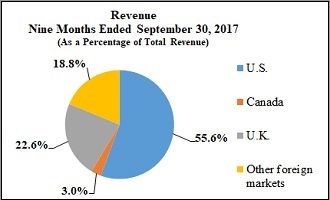 The Other Foreign Markets segment revenue was $4.7 million and $3.3 million or as a percentage of total revenue was 18.6% and 14.5% for the three months ended September 30, 2017 and 2016, and $13.8 million and $8.7 million or as a percentage of total revenue was 18.8% and 12.8% for the nine months ended September 30, 2017 and 2016. The increase in revenue of $1.4 million or 44.0% during the three months ended September 30, 2017 compared to the same period in 2016 was due to increase in revenue as a result of increased attendance (i.e. fulfillment) of $1.4 million or 53.6%. The increase in revenue of $5.1 million or 58.6% during the nine months ended September 30, 2017 compared to the same period in 2016 was due to increased attendance (i.e. fulfillment) of $3.6 million or 43.7% and increase in recognition of revenue from expired contracts of $1.5 million. Revenue was $25.2 million for the three months ended September 30, 2017 compared to $22.5 million for the three months ended September 30, 2016. Revenue increased $2.7 million or 12.0% during the three months ended September 30, 2017 compared to the same period in 2016. The increase in revenue was due to increase in recognition of revenue from expired contracts of $1.8 million or 42.9% and increased attendance (i.e. fulfillment) of $0.9 million or 4.9 %. 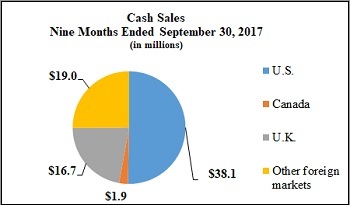 Cash sales were $24.5 million for the three months ended September 30, 2017 compared to $21.5 million for the three months ended September 30, 2016, an increase of $3.0 million or 14.0%. The increase was driven primarily by a $1.3 million increase in our U.S. segment, a $0.9 million increase in our U.K. segment, a $0.6 million increase in our Other Foreign Markets segment and a $0.2 million increase in our Canada segment. Total operating costs and expenses were $23.6 million for the three months ended September 30, 2017 compared to $21.7 million for the three months ended September 30, 2016, an increase of $1.9 million or 8.8%, which is consistent with the increase in revenue. The increase was primarily due to a $1.1 million increase in direct course expenses, a $0.5 million increase in general and administrative expenses, of which $0.1 million was due to our new Enterprise Resource Planning ("ERP") system upgrade, a $0.4 million increase in advertising and sales expenses, partially offset by a $0.1 million decrease in royalty expense. Direct course expenses relate to our free preview workshops, basic training and advanced training, and consist of instructor fees, facility costs, salaries, commissions and fees associated with our field representatives and related travel expenses. Direct course expenses were $13.4 million for the three months ended September 30, 2017 compared to $12.3 million for the three months ended September 30, 2016, an increase of $1.1 million or 8.9%, which was primarily related to increases in venue and travel costs and commissions due to increased cash sales. We generally obtain most of our potential customers through internet-based advertising. The trend of increasing online advertising and reducing direct mail and radio advertising continued during the three months ended September 30, 2017, as we believe it is a more cost-efficient method of attracting potential customers. Advertising and sales expenses consist of purchased media to generate registrations to our free preview workshops and costs associated with supporting customer recruitment. We obtain the majority of our customers through free preview workshops. These preview workshops are offered in various metropolitan areas in the U.S., the U.K., Canada, and other international markets. Prior to the actual workshop, we spend a significant amount of money in the form of advertising through various media channels. Advertising and sales expenses were $5.0 million for the three months ended September 30, 2017 compared to $4.6 million for the three months ended September 30, 2016, an increase of $0.4 million, or 8.7%. As a percentage of revenue, advertising and sales expenses were 19.9% and 20.5% of revenue for the three months ended September 30, 2017 and 2016, respectively, a decrease of 0.6%. We have licensing and related agreements with Rich Dad Operating Company ("RDOC"), whereby we have exclusive rights to develop, market, and sell Rich Dad-branded live seminars, training courses, and related products worldwide. In connection with these agreements and our other licensing agreements, we are required to pay royalties. Royalty expenses were $1.1 million for the three months ended September 30, 2017 compared to $1.2 million for the three months ended September 30, 2016, a decrease of $0.1 million, or 8.3%. General and administrative expenses primarily consist of compensation, benefits, insurance, professional fees, facilities expense and travel for the corporate staff, as well as depreciation and amortization expenses. General and administrative expenses were $4.1 million for the three months ended September 30, 2017 compared to $3.6 million for the three months ended September 30, 2016, an increase of $0.5 million, or 13.9%. The increase was primarily driven by increases of $0.3 million in compensation costs and $0.1 million for the implementation of our new ERP system, which commenced in October 2016. The Company recorded an income tax expense of $119.0 thousand and $8.0 thousand for the three months ended September 30, 2017 and 2016, respectively. Our effective tax rate was 7.9% and 0.7% for the three months ended September 30, 2017 and 2016, respectively. Our effective tax rates differed from the U.S. statutory corporate tax rate of 35.0% primarily because of the mix of pre-tax income or loss earned in certain jurisdictions and the change in our valuation allowance. During the fourth quarter ended December 31, 2016, we determined that valuation allowances against U.S. and U.K. (Rich Dad Education Limited only) deferred taxes were no longer required. We record a valuation allowance when it is more likely than not that some portion, or all, of the deferred tax assets will not be realized. As of September 30, 2017 and December 31, 2016, valuation allowances of $4.1 million and $4.5 million, have been provided against net operating loss carryforwards and other deferred tax assets. Our valuation allowance increased by $43.0 thousand for the three months ended September 30, 2017. There were no significant changes in our valuation allowance during the three months ended September 30, 2016. See Note 7 Income Taxes, for further information. Net income was $1.4 million or $0.06 per basic and diluted common share for the three months ended September 30, 2017 compared to net income of $1.2 million or $0.05 per basic and diluted common share for the three months ended September 30, 2016. The increase in net income of $0.2 million, or $0.1 per basic and diluted common share was primarily driven by increase in revenue, partially offset by increase in operating expenses. Revenue was $73.4 million for the nine months ended September 30, 2017 compared to $68.6 million for the nine months ended September 30, 2016. Revenue increased $4.8 million or 7.0% during the nine months ended September 30, 2017 compared to the same period in 2016. The increase in revenue was due to increased attendance (i.e. fulfillment) of $3.4 million or 6.1% and increase in recognition of revenue from expired contracts of $1.7 million or 15.0%, which was partially offset by the decline in recognition of revenue of $0.3 million, due to the change in our revenue recognition policy with regards to DVD fulfillment. 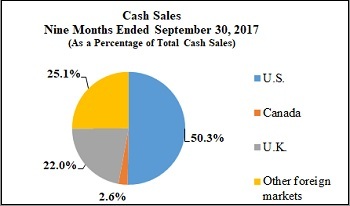 Cash sales were $75.7 million for the nine months ended September 30, 2017 compared to $65.5 million for the nine months ended September 30, 2016, an increase of $10.2 million or 15.6%. The increase was driven primarily by a $5.2 million increase in our Other Foreign Markets segment, a $3.2 million increase in our U.S. segment and a $2.4 million increase in our U.K. segment, which was partially offset by a $0.6 million decrease in our Canada segment. Total operating costs and expenses were $70.6 million for the nine months ended September 30, 2017 compared to $66.3 million for the nine months ended September 30, 2016, an increase of $4.3 million or 6.5%. The increase was primarily due to a $3.0 million increase in direct course expenses, a $1.4 million increase in general and administrative expenses, of which $0.7 million was due to our new ERP system upgrade, and a $0.4 million increase in royalty expense, partially offset by a $0.5 million decrease in advertising and sales expenses. Direct course expenses relate to our free preview workshops, basic training and advanced training, and consist of instructor fees, facility costs, salaries, commissions and fees associated with our field representatives and related travel expenses. Direct course expenses were $39.5 million for the nine months ended September 30, 2017 compared to $36.5 million for the nine months ended September 30, 2016, an increase of $3.0 million or 8.2%, which was primarily related to increases in venue and travel costs and in commissions due to increased cash sales. We generally obtain most of our potential customers through internet-based advertising. The trend of increasing online advertising and reducing direct mail and radio advertising continued during the nine months ended September 30, 2017, as we believe it is a more cost-efficient method of attracting potential customers. Advertising and sales expenses consist of purchased media to generate registrations to our free preview workshops and costs associated with supporting customer recruitment. We obtain the majority of our customers through free preview workshops. These preview workshops are offered in various metropolitan areas in the U.S., the U.K., Canada, and other international markets. Prior to the actual workshop, we spend a significant amount of money in the form of advertising through various media channels. Advertising and sales expenses were $14.7 million for the nine months ended September 30, 2017 compared to $15.2 million for the nine months ended September 30, 2016, a decrease of $0.5 million, or 3.3%. As a percentage of revenue, advertising and sales expenses were 20.1% and 22.2% of revenue for the nine months ended September 30, 2017 and 2016, a decrease of 2.1%. We have licensing and related agreements with RDOC, whereby we have exclusive rights to develop, market, and sell Rich Dad-branded live seminars, training courses, and related products worldwide. In connection with these agreements and our other licensing agreements, we are required to pay royalties. Royalty expenses were $3.7 million for the nine months ended September 30, 2017 compared to $3.3 million for the nine months ended September 30, 2016, an increase of $0.4 million, or 12.1%. General and administrative expenses primarily consist of compensation, benefits, insurance, professional fees, facilities expense and travel for the corporate staff, as well as depreciation and amortization expenses. General and administrative expenses were $12.7 million for the nine months ended September 30, 2017 compared to $11.3 million for the nine months ended September 30, 2016, an increase of $1.4 million, or 12.4%. The increase was primarily driven by increases in labor costs and $0.7 million for the implementation of our new ERP system, which commenced in October 2016. The Company recorded an income tax benefit of $107.0 thousand and income tax expense of $27.0 thousand for the nine months ended September 30, 2017 and 2016, respectively. Our effective tax rate was (3.7)% and 1.0% for the nine months ended September 30, 2017 and 2016, respectively. Our effective tax rates differed from the U.S. statutory corporate tax rate of 35.0% primarily because of the mix of pre-tax income or loss earned in certain jurisdictions and the change in our valuation allowance. During the fourth quarter ended December 31, 2016, we determined that valuation allowances against U.S. and U.K. (Rich Dad Education Limited only) deferred taxes were no longer required. We record a valuation allowance when it is more likely than not that some portion, or all, of the deferred tax assets will not be realized. As of September 30, 2017 and December 31, 2016, valuation allowances of $4.1 million and $4.5 million, have been provided against net operating loss carryforwards and other deferred tax assets. We decreased our valuation allowance by $0.4 million and $1.1 million for the nine months ended September 30, 2017 and 2016. See Note 7 Income Taxes, for further information. Net income was $3.0 million or $0.13 per basic and $0.12 per diluted common share for the nine months ended September 30, 2017 compared to a net income of $2.8 million or $0.13 per basic and $0.12 per diluted common share for the nine months ended September 30, 2016. The increase in net income of $0.2 million was primarily driven by increase in revenue, partially offset by increase in operating expenses. For a discussion of our critical accounting policies and estimates that require the use of significant estimates and judgments, see “Management’s Discussion and Analysis of Financial Condition and Results of Operations-Critical Accounting Policies” in our Annual Report on Form 10-K for the year ended December 31, 2016. In general, we believe we will experience increased demand for our products and services as global economic conditions continue to slowly improve. We believe that our products and services appeal to those who seek increased financial freedom. If we experience a prolonged decline in demand for our products and services, it could have a material adverse effect on our future operating results. Historically, we have funded our working capital and capital expenditures using cash and cash equivalents on hand. However, given our relatively modest operating cash flows during the past two years combined, we have needed to manage our cash position to ensure the future viability of our business. Our cash flows are subject to a number of risks and uncertainties, including, but not limited to, earnings, seasonality, and fluctuations in foreign currency exchange rates. Based upon current and anticipated levels of operations, we believe cash and cash equivalents on hand will be sufficient to fund our expected financial obligations and anticipated liquidity requirements. During 2014, in the U.S., we entered into agreements with third-party financing companies that provide our customers with financing options not previously available to them for the purchase of our products and services. This source of funds for our customers had a positive impact on both our revenue and operating cash flows and we expect it to continue to have a positive impact on our business going forward. Net cash provided by operating activities was $4.7 million in the nine months ended September 30, 2017 compared to net cash used in operating activities of $2.0 million in the nine months ended September 30, 2016, representing a period-over-period increase of $6.7 million. This increase was primarily the result of an increase in current liabilities for deferred revenue in 2017 as a result of increased cash sales. Net cash used in investing activities was $114.0 thousand in the nine months ended September 30, 2017 and $40.0 thousand in the nine months ended September 30, 2016, representing our purchases of property and equipment. Our consolidated capital structure as of September 30, 2017 and December 31, 2016 was 100.0% equity. Net cash used in financing activities was $8.0 thousand and $7.0 thousand in the nine months ended September 30, 2017 and 2016, respectively. We expect that our working capital deficit, which is primarily the result of our deferred revenue balance will continue for the foreseeable future. As of September 30, 2017 and December 31, 2016, our consolidated current deferred revenue was $58.3 million and $54.4 million. Our cash and cash equivalents were, and continue to be, invested in short-term, liquid, money market funds. Restricted cash balances consisted primarily of funds on deposit with credit card processors and cash collateral with our credit card vendors. Restricted cash balances held by credit card processors are unavailable to us unless we discontinue sale of our products or discontinue the usage of a vendor’s credit card. We had no off-balance sheet arrangements as of September 30, 2017. An evaluation of the effectiveness of the design and operation of our disclosure controls and procedures (as defined in Rule 13a-15 under the Securities Exchange Act of 1934) was carried out under the supervision and with the participation of our management, including our Chief Executive Officer (“CEO”) and Chief Financial Officer (“CFO”). As of September 30, 2017, based upon that evaluation, the CEO and CFO concluded that the design and operation of these disclosure controls and procedures were effective. There has been no change in our internal control over financial reporting that occurred during the three months ended September 30, 2017 that has materially affected, or is reasonably likely to materially affect, our internal control over financial reporting. We are subject to a number of contingencies, including litigation, from time to time. For further information regarding legal proceedings, see Note 10 Commitments and Contingencies, to our condensed consolidated financial statements. For information regarding risk factors, please refer to Part I, Item 1A in the Company’s Annual Report on Form 10-K for the year ended December 31, 2016. There were no sales or repurchases of the Company's equity securities during the three months ended September 30, 2017. 10.1 Employment Agreement dated September 1, 2017 by and between Legacy Education Alliance, Inc. and Anthony C. Humpage (Incorporated by reference to Exhibit 10.1 in the Company's Form 8-K filed with the SEC on September 6, 2017). 10.2 Employment Agreement dated September 1, 2017 by and between Legacy Education Alliance, Inc. and Christian Baeza (Incorporated by reference to Exhibit 10.2 in the Company’s Form 8-K filed with the SEC on September 6, 2017). 10.3 Employment Agreement dated September 1, 2017 by and between Legacy Education Alliance, Inc. and James E. May (Incorporated by reference to Exhibit 10.3 in the Company’s Form 8-K filed with the SEC on September 6, 2017). 101* The following materials from Legacy Education Alliance, Inc.’s Quarterly Report on Form 10-Q for the quarter ended September 30, 2017, formatted in XBRL (eXtensible Business Reporting Language): (i) Condensed Consolidated Balance Sheets as of September 30, 2017 (Unaudited) and December 31, 2016, (ii) Condensed Consolidated Statements of Operations and Comprehensive Income (Loss) for the three and nine months ended September 30, 2017 and 2016 (Unaudited), (iii) Condensed Consolidated Statement of Changes in Stockholders’ Deficit for the nine months ended September 30, 2017 (Unaudited), (iv) Condensed Consolidated Statements of Cash Flows for the nine months ended September 30, 2017 and 2016 (Unaudited) and (v) Notes to Condensed Consolidated Financial Statements (Unaudited).